The current chromatographic methods used in quality control of Chinese herbal medicine are time consuming and usually require expensive instruments, yet cannot provide real-time results. 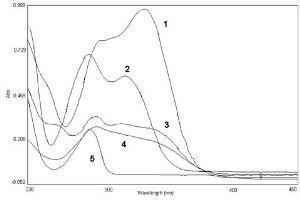 This paper is aimed to develop a novel spectrophotometric method for the determination of phenolic acids that could be used for routine quality control of Danshen Injections (DSI). In analyzing the phenolic acid contents in Danshen Injections (DSI), a partial least-squares (PLS) regression models by correlating the concentration of five phenolic acids in DSI determined by high performance liquid chromatography with the UV spectral data was developed. Also, various spectral pretreatments and different sample classification methods were optimized. The regression models were subsequently validated with 20 new samples. Results: The validation studies revealed that the root-mean-square error of prediction of these phenolic acids varied from 5.19 to 22.7 µg/ml. The prediction results are satisfied for the routine use in the process control. Conclusion: This novel method may offer a fast and accurate approach in the on-line quality control of Chinese herbal medicine.